Summertime’s here and the cotton is . . . probably the preferred fabric of your Zara garment. 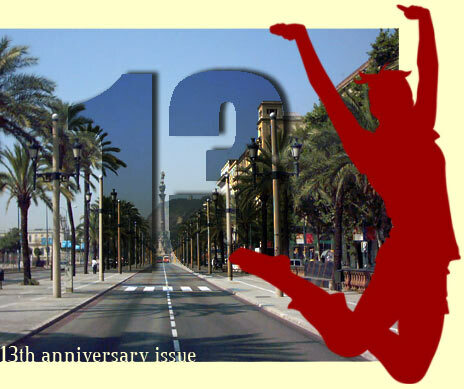 Hey, this is The Barcelona Review’s 13th Anniversary Issue! It’s not as old as my cat, but then neither is the pet store clerk (she’s one year younger than the cat and 4 years older than the review). Still, we’ve been around since 1996 when you could count the internet lit reviews on one hand. I’m happy to see the proliferation of fine reviews which have sprung up over the years; the more good fiction that gets out there, the better. And I’m proud of our crew which has stood the course. Some right good fiction lined up, too, to kick off our 13th . . .
U.S. writer Kevin Wilson has made a splash with his recently released collection Tunneling to the Center of the Earth, and here we have the title story, with a first-ever Spanish translation to accompany it. Teen years can be hard and each kid has to work through it his own way. Why not take up digging? You know, like a big hole in the backyard. This holds many possibilities, it seems, and can keep the kids out of your hair. In a style reminiscent of George Saunders, Wilson creates his own slightly more contained style, which packs every bit as much punch. Another marvelous discovery this year is Congolese-American Alain Mabanckou, whose book, Broken Glass, was recently translated from the French by U.K.’s Serpent’s Tail. Broken Glass is the main character, a regular at the Congolese bar, Credit Gone West, where, pushed by the owner, he records the stories of the bar’s raggle-taggle clientele. Here we present the story of Robinette, who tries to uphold her reputation of being able to piss longer than anyone else. Mabanckou has one foot squarely in the here and now, and the other dangling just over the edge into the realm of great high story-telling. It’s a hoot and a half, don’t piss yourself (see review of Broken Glass in this issue). From the U.K., two highly diverse voices that nicely cover two very different worlds. The highly esteemed writer, Tessa Hadley (The Master Bedroom; Sunstroke and Other Stories), resident of Wales, offers The Enemy, a polished and sophisticated story of two 70s radicals, with a complex past relationship, who meet up again in middle age. Hadley follows in the tradition of Jane Austen to Ian McEwan, nuanced narrative in fine prose which probes the subtle edges of the psyche. And from Bradford, writer Joolz Denby (Billie Morgan; Borrowed Light), performance and spoken word artist, and tattoo artist, delivers the raw and gritty in two original pieces: Spook, relating the correspondence of a sicko, woman-hating teen, tapped out on his stolen Apple Mac laptop; and Murder, a short, succinct story of just how easily it can come about . . . before you know it, like. Two more American writers with original pieces: Buzz Mauro’s Twenty-seven Uses for Imaginary Numbers, a coming-of-age story via the twist of numbers, perhaps better called a coming-of-math story; And Vincent Eaton’s Ledge, which puts a security guard to the test when he confronts a potential jumper on a 7th floor ledge. In picks from back issues, George Saunders’ Sea Oak and Donald Ray Pollack’s Pills, from this year’s brilliant collection, Knockemstiff, which garnered him the honor of receiving the PEN/Robert Bingham Fellowship for Writers. Well deserved. Continuing with our new addition of Video, we have Knotted, filmed by Tom Shell, based on the short story by Paul A. Toth. Two juxtaposed points of view spanning a wide generational gap. Very well done. Our quiz this issue is on Kids in Literature – no, not children’s lit, no Harry Potter, but those great pre- and mid-teen voices in adult fiction. For answers to Excerpts from 15 Top 21st-Century U.S. Novels, click here. And for DeLiilo, here. No winner on the former, and four correct responses on the latter; we had to draw and the winner came up Carl Kuzio. A 30-euro gift certificate from Amazon goes to the winner. In book reviews, we have Frederick Barthelme’s new release Waveland, and the aforementioned Alain Mabanckou’s Broken Glass, both hits with this reviewer. Local news: If you live State side, you may not know the biggest news of the past month here: Barça’s football team beat Manchester United to win the European Cup after already winning La Liga and the Copa del Rey, making it a triple victory. It was chaos in the streets as thousands descended on Plaça Catalunya to celebrate. The fever pitch ended in a brawl with the police, and nearly two hundred injuries, but it didn’t seem to much dampen the parade. We’ll be back with our next issue, Sept 1. If you don’t use FB, click here if you’d like to be notified when new issues are online. And drop us a line with your thoughts.